A small, completely unknown developing team succeeded in 1998 to create, with the game Half-Life, one of the biggest 3-d action hits for the PC. Half-Life's innovative successes with a lot of scripted events and intelligent opponents raised the bar for 3d-Shooter games upwards for all those that followed. However, not only the game in itself was a great success, but also the Mod abilities were used more than anytime before. "Team Fortress" soon appeared in a patch, a brilliant multiplayer mod and with "Counterstrike" the most successful Mod scene reached its climax. The "They Hunger" trilogy offered brilliant and fun play for free download as well. After Half-Life 2 was announced, gamers drooled in anticipation but there were delays including one of a full year after some source code was stolen. Again the developers of Valve have thought a lot and have tried to make another groundbreaking PC game. The graphics are amazing, to say the least, but with the most realistic physics and destructible environments it is sure to amaze. Completely without cutscenes and scripted events this time the story is told more through the actual gameplay. For this a lot of time and energy was put into the NPC facial movements which should become indispensible for telling the story. This time the action takes place in a fictional town in northern Europe called "City 17". 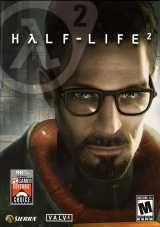 You take over the role of Gordon Freeman again and meet some characters from the 1st game along the way. Gordon's enemies, apart from alien wildlife which found its way to Earth, are mainly Combine forces, which utilize a variety of firearms, gadgets and vehicles. Policemen and foot soldiers work along with helicopters, gunships and gigantic walking machines to hunt you down. To defend himself, Gordon has a range of weapons available: from the iconic crowbar for close-quarter fighting, through pistols and rifles, up to grenades and a rocket launcher. Most notable weapon is the "gravity gun", with which one can pick up objects, hold them in the gun's antigravity field, then hurl them at the enemy with great force. 1 2 3 Level Demo 751MB ( @ Gamer's Hell) requires Steam account.